For the last several years (probably 5-6 years now) I’ve ordered a Personal Planner — which, as the name states, allows me to personalize MY planner to MY specifications and needs. I’m a huge fan of this planner and have given several away to various readers over the past few years. 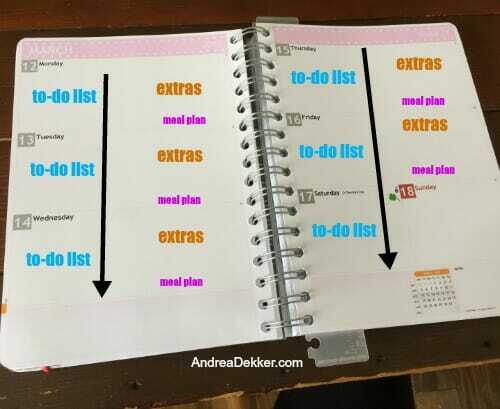 I’ve always used the A5 planner, and I’ve always used the same vertical column setup for the days of the week (see below). However, this year I decided I wanted to try a different page layout — so I went with horizontal rows instead. I fully realize how ridiculously menial this change might sound to some of you… but for me, it has been an extremely positive change that has saved me time and energy, and helped increase my productivity! I’m currently using the left side of each daily “row” to list off 5-10 to-do’s for the day. (This takes the place of the sticky note system I was using before!) I then use the right side of each daily row to note upcoming meetings, appointments, special activities for Nora at school, anything noteworthy with Dave’s schedule, and our dinner menu for that day. The beautiful thing about this system is that my to-do lists naturally flow into the next day. For example, if I don’t finish a task on Monday, I don’t need to re-write it for Tuesday. I just leave it uncrossed, and continue adding Tuesday’s to-do’s underneath. My to-do list just continues down the left side of each page as the week progresses. Of course, this doesn’t work on Wednesdays or Sundays as those days are at the bottom of the page, but considering I usually don’t have many extra to-dos on Sunday, this new layout really seems to work well for me right now. Plus, I have extra blank areas for “notes” under Wednesday, Saturday, and Sunday, so extra to-dos can simply spill over! Another nice visual aspect of this new layout is that I can immediately see any and all “extra” activities I have going on each week, since they are all written on the right side of each page. I’ve been writing all of my activities, appointment, reminders, etc. in black, Nora’s in pink, and Dave’s in blue — making it super easy to see who has extra events at a glance. I find it interesting that simply changing the layout has made such a big difference for me — especially since the overall usable space of the planner is exactly the same. It’s only been 2 months of using this new layout, but I’m “sold” for now — and I have a feeling I’ll order the same layout next year! Do you have a specific planner layout you like best? If so, why? I love my Bullet Journal…… check out Ryder Carroll’s 3 minute YouTube video and Pinterest has tons of ideas. I successfully used all types of planners through the years but this one is the best. It worked so well at home, I created one for work and my productivity sky rocketed. I’ve never been able to get into bullet journaling, but I know SOOOOO many people who love it. Thanks for the recommendation! I must be hooked on to your blog. I started reading your posts after my first child was born in 2012. 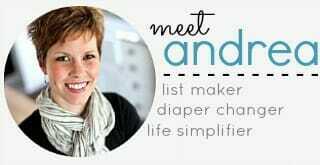 I learnt so much about parenting simple style. Since then I have read your posts and have seriously liked them. Here at west coast, california, we get similar layout planner at half price books. Its my absolute fav planner. Every week has a little great quote by someone. They uplift my spirits a little at times. It only costs me 7.99$ and it has a year and half calendar in it. They come out June/July/Aug, every year. Do check them out. This is my one pen and paper planner amidst my tech gadgets. thank you for your blog and keep it coming many years! awww… thanks so much! and great tip for the planner — I’ll have to check that company out! Oops, I noticed I posted old price. 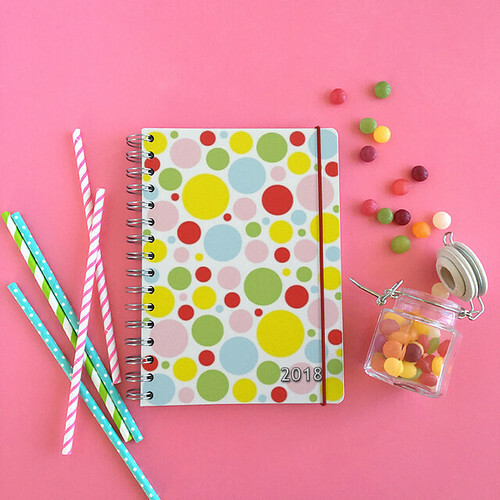 The current price for do-it-all planner 17 months is 14$, my mistake. My husband and I share our calendars with one another (so mine is in pink, his shows up on mine in green), plus, I have a 3rd color for kid things (we signed each kid up for a gmail account once we settled on names, so the plan would be to have them eventually share their calendars with us when we get to that point). It means I can look at our week quickly and see who has what and when. I use Evernote to maintain my personal “to do” list as well as our meal plan (I have separate notes for each), and a 3rd note with any pertinent work things I need to do (I work for a small business, and I work from home, so I need a place to keep those things) – again, I like that this allows me to access it from my computer or phone. If my boss calls about something, I can just pop open my note and add it to my list, or know if I had any questions for him. I also have an app for our grocery list, so I can always add something in seconds, so I’m not trying to remember what we need (and when i’m meal planning, I can add any items we don’t currently have on hand). For me, I feel like paper ends up causing clutter, and I already battle the clutter bug naturally, so I try to eliminate any paper I can so it doesn’t take over our life! HAHA!! 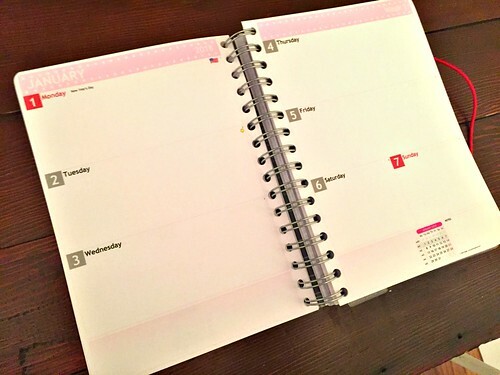 The company that makes the planner refills I use offers different 12-month start-end dates. Several years ago, I started using the April-to-March refills. It works well for me because I now have 1 less important task and expense during the holidays. I also like having both December and January pages in my planner at the same time because of the busyness of the season. that’s awesome — and so smart! I’ve always done October – October (for similar reasoning — get it done before the holidays) but I just totally forgot to order my planner this year (blame it on Clara being born on Sep 25)!! I got it in December this year, but might switch back to October next year. Or maybe I’ll start in August now that both Nora and Simon will be in school next year. So many options! I do something like this and it works well for me. This was my first year to switch from a large wall calendar to a planner. I purchased the Blue Sky Weekly/Monthly 8.5×11 at Wal-Mart and since it was plain blue, it was about $10 (I keep it folded over where the cover doesn’t show so it isn’t a big deal that it is plain). After using it for a few months, I divided the horizontal pages into 3 sections: the left 1/2 of the page is for appointments for myself or where I need to drive someone else and my to-dos for that day; the middle 1/4 of the page is for my older children’s activities where they drive themselves but I need to know about them so we can work out driving arrangements; and the right 1/4 of the page is where I list the menu for the day and record my goals/daily activities like Bible time, exercise, specific chores for that day, etc. Unless I am going to a meeting where I know I will need it, I leave my planner at home. If I am going to an appointment where I know I will need to schedule a follow up in a few weeks, I look ahead before I leave to see if there’s anything on the calendar for that time. Usually six month or yearly appointments aren’t an issue. The benefit of not having the planner with me at other times is that if someone asks me to do something, I have the out of having to check my calendar at home. It gives me time to think about whether that is something I really need to do since I have a tendency to say yes and over commit. 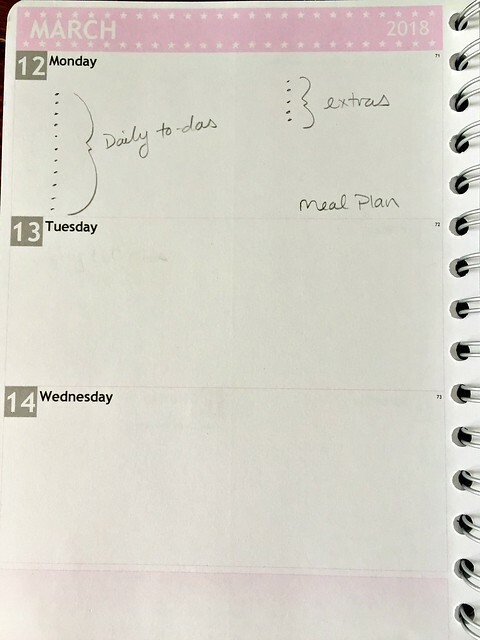 For years I used the horizontal weekly layout. Last year I got a Happy Planner that had the vertical layout, I did not care for it. I hung in there for the year as I did not want the money invested in the Happy Planner (and decorating supplies) to go to waste. But I am relieved to be back to my horizontal for 2018. So I can totally relate to what you are talking about. I love the Blue Sky planners and have been using them for years. This year, I got a personalized one so I could customize it a bit. It is 7 X 9″ size, which is just right for me and has the same page layout as you show. However, I have been just writing things in and never thought to keep to-do’s and appointments on different sides. I love your idea and will try it. I love to read others ideas on using planners because sometimes it gives you an “aha!” moment. I am retired and didn’t think I would need a planner as much once I retired. Boy, was I wrong! It keeps me sane. For now, I have the vertical layout from personal planner. Interesting perspective on the horizontal layout. I’ll have to consider it for next year. I use this planner along with cozi for now. I am a paper and pen girl at heart but digital is a must for our family. My husband is a fire captain with a typical fire schedule but that means it doesn’t look the same week-to-week. We have three kids at two schools with two different schedules. And then I work part time outside the home as a physical therapist (sometimes at two locations) with a schedule that rotates around my husband’s. Digital so we can both see our’s and the kids schedules was a must. So… the paper planner for me has become my personal errand and to do planner, habit tracker, place for notes, etc. Not sure I have found the perfect match but I’ll leep trying! Yes, I am a huge fan of a daily planner and do use it daily! 🙂 Although through the years, with four children, husband, home-based business and now a PT job in addition, I have gone from using a refillable zip style from Day Planner to a very cumbersome Franklin Covey style — and spent way too much time this past fall pining over a FiloFax version that I had hoped would fit my tablet as well but couldn’t justify the added expense or need to have such a fancy planner at this time in my life. So, with all that in mind, and a desire to try to simplify and combine my daily “to-do” list and daily activities all while staying current, I happened to come upon a beautiful, basic yet very versatile and inexpensive planner last fall at Wal-Mart that I have come to rely upon! I liked it so much that I bought both sizes available — which fit in my purse if needed but keep the larger one on my desk by my laptop — a pocket size and one that is 5 3/4 x 8″. It’s from a company called “Plan Ahead”. http://www.planaheadnow.com I appreciate the durability, the tabs for monthly and daily calendar, the sections for “Future Planning”, a 4 year calendar for reference, “Notes”,”Passwords”, “Contacts”. I also like that fact that with each monthly calendar, there are typically a few empty boxes which I utilize to jot down something important for that month in particular. With the weekly page layout — set up similarly to the way yours currently is except mine is Monday through Thursday on the left and Friday through Sunday on the right — at the end of each week, there is a lovely box entitled “Notes”. I’ll have to look this up — I’ve never heard of the MomAgenda! I’ve always instinctively put to dos on the right hand side of the page and appointments on the left… I’m going to swap them over definitely now…. who would think it would make such a difference! I can see it working for me! haha — whatever works for you is what you should do… but I have found it handy to have the to-do’s on the left side as my mind naturally works from right to left, so I tackle my to-dos first and then later in the day have appointments, meetings, etc. Hi Andrea! I love Personal Planner too! Found it on your blog and love that I can make it to suit my needs, especially the personal dates. We have a lot of birthdays to remember in my family and it’s nice that they print automatically. I have a question about your layout. In the pictures it looks like each day is split into two boxes. 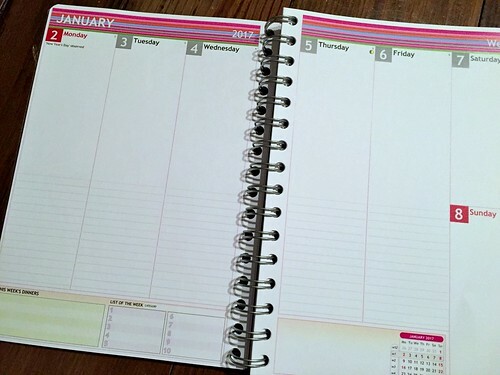 Did you do that once you got your planner? I couldn’t figure out a way to do that on their website. I really like the idea of having two sections the way you have them. I hope you have a great day and an awesome week! yes, it is nice to have all the birthdays and holidays in the planner right away. As for the divided columns — I just divide it on my own, but you SHOULD be able to divide it on their website too. You can choose lines for one side and blank for the other side as a natural divider. Next year! Since 2003 I’ve used the Moleskine with layout as you used first, my open page on the right is divided in 4 squares for different purposes. I discovered the Moleskine this summer, and have customized it similar to your and Andrea’s uses. It works well for me. I am laughing to my self because I always hated that layout and could never figure out this to use it – but your set up makes perfect sense, such a smart way to do it! I schedule all my Dr and dentist appointments online (from my computer) and all Nora’s schedules are emailed to me from school and church — so again, keeping the planner by my computer works really well for now. Dave knows that he should email me anything important otherwise there’s a good chance he’ll either forget to tell me or I won’t write it down! I must be the only paper free reader today. We travel a lot so just keeping track of routes, maps, tickets, reservations etc is a chore and God help me if I forget something. Several months ago I set up a separate “Sunday Basket” for my motor home which has a set of 5 slash pockets but they contain only things pertinent to our trip that have to be on paper. After we get back I’ll pull out anything I don’t need any longer but the insurance, membership cards etc all stay in the basket. They were scattered all over our motor home and now they are in one place. So that leads me to the one thing I always seemed to not have with me cuz I forgot it! So I moved everything to an iPad. I use the calendar (actually I have five within the app) for things that have either a fixed time of day such as the start of a sporting event or date of vet appt OR if it’s an all day event I can span several days. When my brother was out of town and our mom ailing I had his schedule for the week he was gone. For my todo list we have several Amazon Alexis devices in the house and I can add to a todo wherever I am and if I’m on the road they are in my Alexa app on my phone. That list syncs with AnyList app which has all my menus. On that app I can see every menu, every grocery store need, and my todos. Sounds complicated but it’s not. It’s extremely simple. Plus it’s very hard to write on paper when driving. I would have the option of printing my calendar but there’s no point. It’s all in iCloud and accessible from any phone or computer everywhere except Japan. The other iOS app I use a lot is for reminders such as give dog flea med or pick up dry cleaning. These repeat at fairly consistent intervals but do not fit into the format of an appointment. You can have them remind you on a date and repeat. No need to open a calendar. Moving to this system really paid off after having shoulder surgery. I taught myself how to hunt and peck tap on iPad and iPhone. My success in learning to write was not as great. After I could use my right hand again I never went back to paper. Just in case someone is curious I have 5 calendars in my iOS app. I can chose to see all or none. 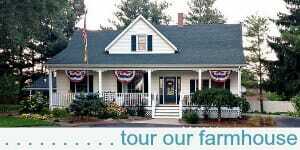 First is mine – my appts or events that require me to be there like a vet appt. until the dog starts to drive, his activity is on mine. My second calendar is my house hold calendar. 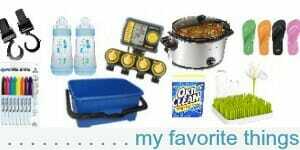 On that one I have various repeating things that are specific to my house and include three pay roll deposits, street sweeper schedule, AmVet Pickup day, annual city wide yard trimming day, window cleaner and house cleaner schedule and a few more. My third is my husband’s business travel. I can attach itinerary to the calendar and link to his flight tracker software. The lesser used ones are set up for projects and other events. I can set my iPad at home to display 3 running apps st once so I can always look at a todo and a calendar at the same time. Plus the biggest bonus is when I have an appointment saved to my calendar it always has an address, a travel time and an alert as to when to leave. As soon as I get in my car, and connect my iPhone to usb I get a map display instantly telling me my ETA and advising me of traffic issues. We live in a very congested area of the San Francisco Bay Area where a simple 2 mile drive to a grocery store can take 30 min. And the best part of this system is that everyone can access the planner on any device even if the main iPad Pro is left at home. In fact, I have just made sure all my data is synced and left the big one at home many times. All my kindle and audible books plus iBooks all sync so it’s not like I need the big iPad. And it’s backed up safely. Once I had a paper planner that blew into my pool. Now, while it’s unlikely an iPad could be blown off a table in my yard, even if it were I’d still not lose any data. So I’m done with paper! Except those pesky little things like theater tickets and boarding passes we print ahead of time.